I'll bet you never thought that Twin Coach made convertibles - well, they did and especially for one unusual application. Pictured is fleet #4 and one of five 1936 Model 23R's custom built for Motor Stage Inland Motor Tours of Catalina Island, California. Of note is the canvas top which, when rolled back to the spine of the roof from both sides reveals a framing of open panels giving passengers spectacular views and cool breezes on warm summer days. The artwork both over the windshield and amidships was hand done by island artisans of which there has always been quite a community. #4 is signed for Skyline Drive taking steep and winding hills to reach Catalina's highest summit at over 2000 feet - an amazing feat for these little coaches! The tourist mecca known as Santa Catalina Island but often called Catalina Island or just Catalina, is a rocky enclave off the coast of California and is 22 miles long and 8 miles across at its greatest width. Catalina is located about 22 miles south-southwest of Los Angeles and is one of the Channel Islands of California archipelago and lies within Los Angeles County. Most of the island is administered by the Catalina Island Conservancy created by the Wrigley family of Chicago early in the twentieth century. 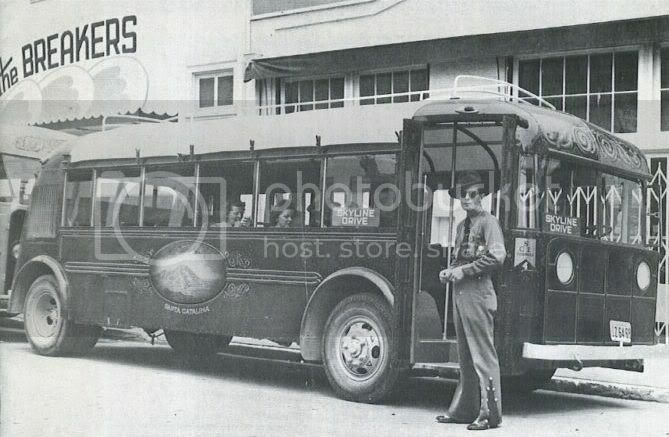 Photo courtesy of the Motor Bus Society.